Yesterday was the Feast of the Sacred Heart of Jesus, which is an important day to us “Cabrini Sisters,” who are really called and understand ourselves to be Missionaries of the Sacred Heart of Jesus. This is a time when we Missionary Sisters and our Lay Missionaries recommit ourselves to God and to the service of God’s people. It is a time of celebration wherever we are in the world. 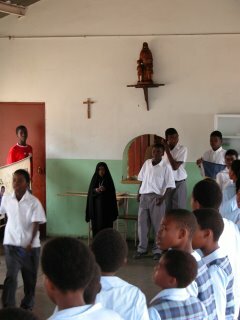 The children at the Hostel worked all week on writing songs and preparing dramas for some of the parables. They wrote songs about God’s love, and did nice dancing to go along with their projects. They then led the activities for all of our staff and the other people who live near by and love to pray and celebrate God. They were wonderful and God’s love for them and theirs for him were palpable. It was a very blessed and grace-filled day. We hung a black African Jesus in each of the dorms. And we ended by having a big celebration- a barbecue where we also ate cake and ice cream. I think it may have been the first time the children had ever had ice cream. All the staff at Cabrini Ministries were also invited and enjoyed the day very much. I am such a fortunate person to be allowed to work with these kids and to help normalize their lives a bit by the ministries we do here. Without the help of so many people we could never do this. Thanks to everyone for caring about these children in Swaziland. I also want everyone to know that the children in the NY Times feature by Nic Kristof, as well as five other children that Mr. Kristof interviewed while he was here, have all had their new uniforms purchased for them. They should be wearing them by Monday. A little girl has touched my heart, and I hope she will touch yours, too. Temdoline is her name, and she lives in Swaziland, Southern Africa, where at 9 years old she is a mother to her siblings, having one by one lost her father, mother, grandmother, and older brother to HIV/AIDS. Her aunt will die of the disease soon, leaving the children to fend for themselves. Her only food is lunch, provided at school by the World Food Program (www.wfp.org). Temdoline says, “Every day I go to school without breakfast, and every day I go to bed without dinner.” Home is a makeshift shelter with a dirt floor. She has one dress to wear, a school uniform with no back to the skirt. To preserve that tattered rag, after school she changes into a pair of shorts, her only other clothing, and is too ashamed to go out without a top. Nicholas Kristof of the New York Times has been writing about Temdoline and other orphan children since his recent trip to sub-Saharan Africa, and you can read his op-ed reports and see his video called: “The World Hasn’t Moved On” at www.nytimes.com/kristof. I wrote him to ask what I could do to help Temdoline and others, and he wrote me back about the Cabrini Foundation and the work that the Cabrini Sisters are doing in Swaziland to help orphaned children and people coping with AIDS. I have been corresponding with Sister Barbara Staley of the Cabrini Mission there, who has told me about their efforts and ways that I could help. I hope you will consider doing something for them also…….most of us who have more than we need are only too happy to help, if we can find out how. Here are some statistics about HIV/AIDS. They are staggering, but PLEASE read them. 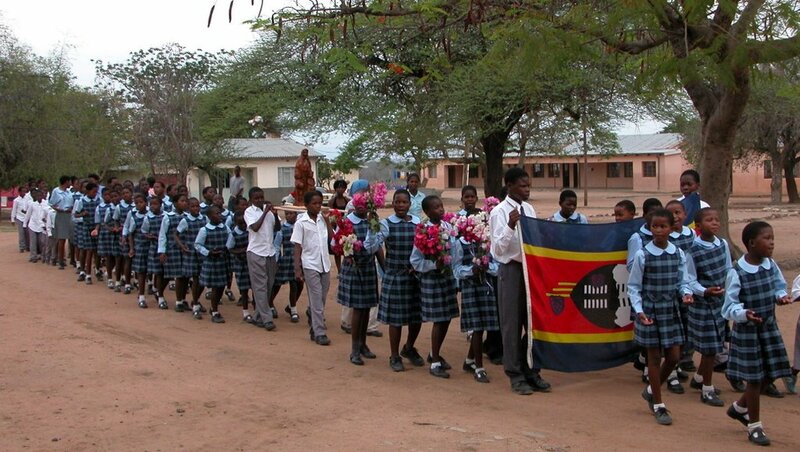 3/4 of HIV/AIDS victims live in sub-Saharan Africa. 13 million African children are orphans because of the loss of their parents from this disease. In the next 4 years, by 2010, there will be 42 million orphans in Africa, and by 2025, 100 million. 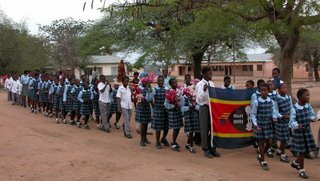 Swaziland has the highest incidence of AIDS in the world, with 40% of adults infected. The life expectancy there has dropped from 55 years to 34. Worldwide, there are 2.3 million children infected, 700,000 in 2005 alone, and 3 million people die from AIDS each year, half of them children under 15, mostly Africans infected during childbirth. 7,900 die every day from the disease, including one child every minute. Since AIDS was recognized in 1981, 25 million people have died, and 40 million others are infected. By 2020, 70 million people will have died from the disease. In India, 5.7 million people have AIDS, 1% of the total population of 1.1 billion people. In South Africa, 5.5 million people are infected, but while a similarly upsetting number, it represents an appalling 19% of the population of 47 million. 90% of people with the virus don’t know they have it. $1.6 Billion was spent fighting the disease in 2001, $8.3 Billion in 2005, and the UN says $17 Billion is needed for 2007. In 2003, the U.S. pledged $15 Billion over 5 years, about what we spend in six weeks on the War in Iraq. A $4 dose of NEVIRAPINE will prevent passing the AIDS virus between mother and child during birth, but less than 10% get the drug. This disease has moved from marginalized groups of the population to mainstream, with most victims now innocent children. There is HOPE if there is HELP. Kenya is providing free ARV (Anti-retroviral Drugs) to AIDS victims, and has reduced prevalence from 14% in 1997 to 4% today. It’s a matter of getting HELP where it can make a difference. Here are some ways you can help Temdoline and other children like her. Realizing that it is easiest for people who want to help to make a financial donation, this can be done on line at www.cabrinifoundation.org. Their website includes full information about their program in Swaziland, and Sister Staley assures me that, if designated for the “Swaziland Mission”, 100% of monetary contributions will go directly to their orphanage and their efforts to care for HIV/AIDS victims. A donation can be made by phone at 212-995-7003, or you can send it by mail to: The Cabrini Mission Foundation, 222 East 19th St. 5D, New York, New York 10003. Specific information can be obtained through e-mail at cmf@cabrinifoundation.org. Sister Staley understands that many people prefer to send goods, and has given me a list of items of particular need, including: multivitamins, toiletries, pens, paper, markers, paper clips, black ankle socks, new underwear, boys and girls shoes up to size 11, shirts, skirts and dresses, blankets, pillow cases, and single sheets. She notes that it is ESSENTIAL that packages be marked “DONATION FOR OVC’s” (orphaned and vulnerable children) because otherwise they will have to pay a high import tax upon receipt. Packages can be sent to: Cabrini Ministries, P.O. Box 5183, Manzini, M200 Swaziland, Southern Africa. The Cabrini Mission is 50 miles from this post office, and parcels may take up to 3 months to reach them, but they make the trip frequently to take patients for medical treatment, so can pick up parcels without a problem. She advises that if you would like acknowledgment of receipt, please put a note inside the box with your e-mail address on it, and she will send you an e-mail to let you know it has arrived. I often think of the “simple life”, when thoughts are consumed with the tasks of the day and the seasons impose the requirements of survival on decisions, when news of the world rarely intrudes, and life is reduced to bare existence on a specific place on earth. Today, the various media most Americans engage with during our day bring the plight of the whole human race to our attention, and our emotions are drawn to the far corners of our globe. It takes an effort to focus on how to “spend” one’s emotional energy, because there are so many issues, so many in need from such myriad causes. It is easy to become numb and turn away from the painful reality endured by others. But, the future beckons us. We may linger in memories of the past and be focused on the present, but the future is where we are headed……..and the children of our world, and their plight, are our future. I can think of so many ways we Americans can help children in need around the globe. If every classroom in America raised money or sent packages of essential goods to an adopted classroom in a developing country, just imagine the good will that we could establish. It is one small way we could regain the soul of America, as well as satisfy our own. 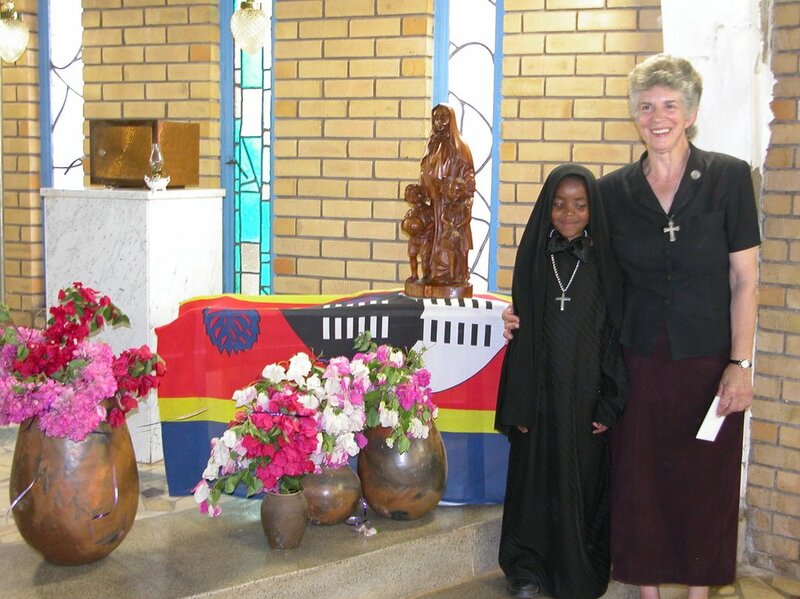 I hope you will join me in making a difference for the children in Swaziland, who are able to find some joy and comfort because the Sisters of the Cabrini Mission are devoted to helping them find their way, when all seems lost. I can only do a little by myself, but together we can do a lot. This is our crocheting group. Someone had donated yarn. We don’t have knitting needles- the children just use pieces of metal. The older woman is a lady from the community. She teaches them how to knit and crochet. She is HIV positive, and was receiving our services, and wanted to give something back. So she decided that she’d teach the children to knit and crochet. It’s worked out wonderfully. They love it. Even the boys love to crochet. Scroll down to see some of the wonderful things the children have made. 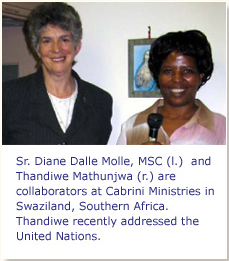 Thandiwe Mathunjwa is the Director of Cabrini Ministries Health Care Outreach in the Lubombo lowveld of Swaziland. She addressed the United Nations General Assembly Special Session on HIV/AIDS/TB as one of 24 civil society speakers from around the world. This is the first time the United Nations allowed the civil society representatives to speak directly with the international country delegations so that the final document and direction in dealing with the AIDS pandemic would contain the wisdom and concerns of governments as well as community based, faith based and other non-governmental organization. Thandiwe received this invitation through UNANIMA International, an NGO in which the Missionary Sisters participate, to present some of our concerns regarding children and AIDS.